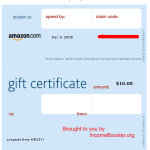 As some of you already know Winzy.com pays you to use their sponsored search engine. If you have never heard about this website, the I will tell you what Winzy is. Winzy.com is a Ask powered search engine that will reward you to use their website. They more you use their searching service, the money points you earn (every search is equal to 2 points). Every point is a ticket in monthly 1000$ drawing. 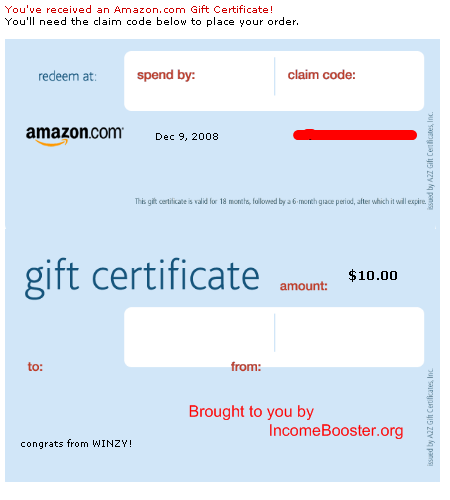 Also every search on Winzy.com is a chance to win an instant prize as I did (more info below). Instant prizes include : 500$ Gift card, Ipod Nano, Ipod Shuffle and other gift cards (25$, 10$ and 5$). Also, when you refer a friend to Winzy, you get 250 bonus points and 100% referral comission. This means if your friend wins 500$ gift card, then you win it too! How cool is that? Conclusion : Winzy is true leader in paid to search industry. They proved that it is possible to earn with such goofy looking work from home opportunities. Even I thought that this website is just for fun before I acutually got paid. So what are you waiting, join Winzy, refer your friends and win some cool stuff. I think you will do just great with this website. Please leave your comments or questions if you have any.